Fortress Of Freedom Board :: View topic - Worldwide Vote (Revised) Available in Beta Form! Worldwide Vote (Revised) Available in Beta Form! Posted: Mon Jan 16, 2017 10:28 am Post subject: Worldwide Vote (Revised) Available in Beta Form! 1. Download the apk on your device. 2. Find the app on your device (probably in "Downloads") with a file manager. 3. Click on the apk file and it self-installs. 4. Android will probably stop the installation because the apk is not from Google Play. So just make an exception for the app in the settings which should pop up automatically and it will continue to self install. Accept the permissions and you open the app and are good to go. No ads or malware guaranteed. 5. Don't see the worldwide vote icon? Go to you app drawer, find the app and icon/widget and drag the widget to your home screen. 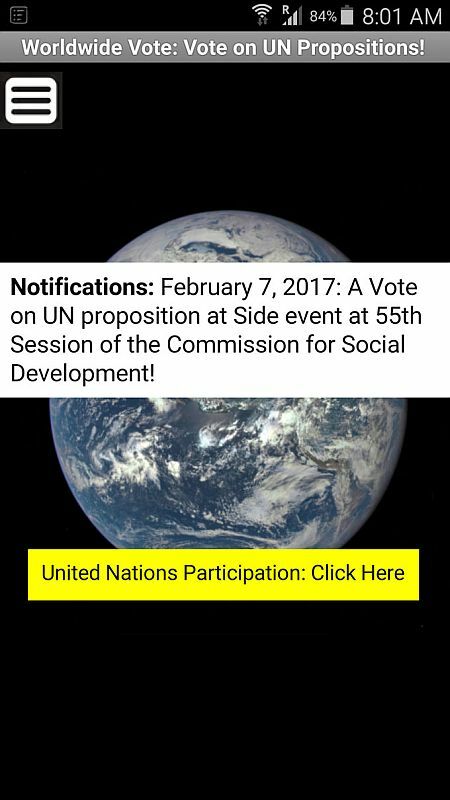 The application is for a side event at the UN but has the added utility of testing the efficacy of general public participation at the UN with app suggestions to listen and know about UN activities along with the ability to vote on UN proposals and record the result for secondary influence in policy making by letting member nations know what the global public thinks about the proposal. This is the fifth major revision of the app and brings improvements to almost every area in the user interface. The major changes on this revision are to the links to the UN News, UN Audio and UN Calendar. The UN News is no longer a link to the app but the mobile version of the UN News sized for smartphones. The UN Calendar is now the mobile web based calendar for UN meetings and events more in keeping with the participatory proposition intent of the app as a whole. The UN Audio is an internet window to the desktop web based UN Audio website. This appears to remain desktop based as they have a dedicated smartphone app and a link exists on the desktop web page. These changes were made as a result of Google no longer supporting many aging browsers and the changes now give real utility to all peoples of the world using Android. Like I said this is still unpublished and in beta form derived from MIT's easy to use "App Inventor" geared toward students from all over the world and endorsed by UNESCO/UNAP. The app only works with Android based devices but will also work with Blackberry 10 devices which have Android runtime. iOS users of iPhones will have to wait until we have the final version as their app development is more restrictive and time consuming than the Android method. This application development is part of the ongoing initiative to get permanent ongoing participation of the general public at the UN and in all aspects of UN activities.